A stay at The Place Aparthotel places you in the heart of Manchester, walking distance from Affleck's Palace and Piccadilly Gardens. This 4-star aparthotel is within close proximity of Arndale Centre and Manchester Conference Centre. Make yourself at home in one of the 107 air-conditioned rooms featuring kitchens with full-sized refrigerators/freezers and microwaves. 32-inch flat-screen televisions with digital programming provide entertainment, while complimentary wireless Internet access keeps you connected. Conveniences include safes and separate sitting areas, and housekeeping is provided daily. Enjoy recreation amenities such as a fitness center or take in the view from a garden. Additional features at this Victorian aparthotel include complimentary wireless Internet access and wedding services. Satisfy your appetite at the aparthotel's restaurant, which serves breakfast, lunch, and dinner, or stay in and take advantage of 24-hour room service. Quench your thirst with your favorite drink at a bar/lounge. 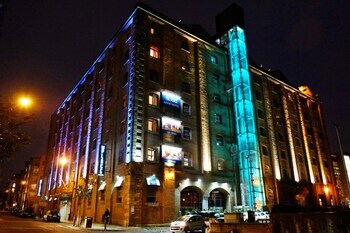 The Place Aparthotel is the perfect Manchester lodging choice for your trip to United Kingdom. With numerous amenities for guests such as 24 hour front desk, fitness center, parking - self, you will wake up at The Place Aparthotel feeling invigorated every day for your time in Manchester. Don’t let this amazing reservation opportunity pass you by, book your stay at The Place Aparthotel today to make the most of your time in Manchester, United Kingdom.